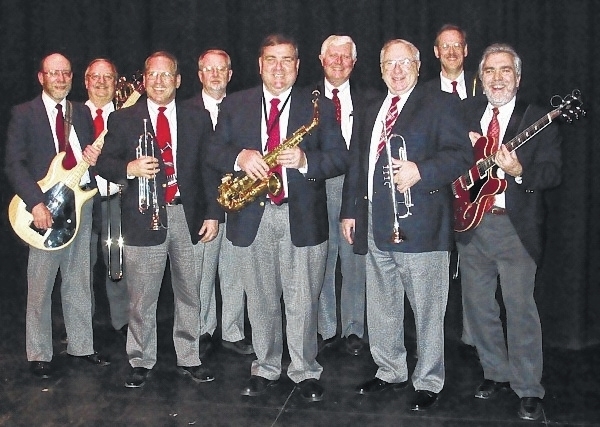 The Bob Gray Orchestra will play 1940s-themed “big band swing” music at a 1940s Dinner Dance at the Champaign Aviation Museum Nov. 14. Tickets are $25 and available from the Champaign County Arts Council. A 1940s-style dinner dance will celebrate veterans and musical performers on Veterans Day. The Champaign County Arts Council and the Champaign County Memorial Foundation will host the event at the Champaign Aviation Museum, 1652 N. Main St., Urbana, on Saturday, Nov. 14. Tickets are $25 and are available at the Arts Council office, 119 Miami St., and on the council’s website using Paypal at www.champaigncountyartscouncil.org. Due to the popularity of the event, the Arts Council recommends purchasing tickets early, as only a limited number are available. Social hour starts at 5 p.m.; dinner will be served at 6 p.m. Music and dancing will be 7-10 p.m. The 10-piece Bob Gray Orchestra will play 1940s big band swing. The band has been in existence since 1973, and its top-caliber musicians also perform in other musical organizations, including The Dayton Philharmonic and the Springfield Symphony. This year, the band will feature local vocalist Lonnee Jensen. Veterans are encouraged to attend in uniform. The diamond sponsor of this event is The Champaign County Memorial Foundation. The bronze sponsor is CT Communications. Additional sponsors include Mercy Memorial Hospital, First Central National Bank of St. Paris, KTH Parts Industries, Perpetual Federal Savings Bank, Dennis & Pat Serie, the Skelley Lumber Company, Walter & Stowe Funeral Home and Willman Furniture. The program is also sponsored by a grant from The Ohio Arts Council, which uses state tax dollars to fund programs such as this to encourage economic growth, educational excellence and cultural enrichment for all Ohioans. For more information, call the Champaign County Arts Council at 937-653-7557.